I have been to this show 22 times now…I can’t believe it either! and each and every time I am always left amazed at the designs of the gardens, all of them – from the Showcase Gardens to the Fresh and Artisan Gardens to the extraordinary displays in the Great Pavilion – stunning floral and horticultural exhibits. For those seeing this show for the very first time, a little planning goes a long way and I will share some of my show secrets to help you enjoy it to the fullest! 4 nights at the 4 Star Superior, Millennium Gloucester Hotel, London. We will enjoy our 3 course Welcome Dinner at the hotel which will include wine, water, tea or coffee. Set against fashionable South Kensington, Millennium Gloucester Hotel London Kensington is a perfect combination of charm, comfort, and attentive hospitality. With its convenient location at the heart of the city and Gloucester Road Underground Station just next door, you’ll discover how easy it is to explore the city. Sightseeing is easy as you’ll find Hyde Park, the Royal Albert Hall, and Kensington Palace are all just a short walk away. Please note check in time in 2 p.m. so if early you can leave your luggage with concierge. Munstead Wood was the home of Gertrude Jekyll and is now in private ownership, however we are very fortunate to be able to arrange a tour of this garden. For garden designers, Munstead Wood is one of the most famous gardens in England. She created ways of planting which were very innovative in their day – and the garden at Munstead Wood was one of the places where she tried out her ideas. The house was designed by Sir Edwin Lutyens and completed in 1896. He was only 20 and she 46 when they first met. It is surrounded by a 10 acre garden in an Edwardian style. Gertrude Jekyll lived and gardened here for more than 30 years. Over a long career in horticulture and planting design she created over 400 gardens in the UK, Europe and the USA (although she never visited the latter). Gertrude Jekyll, 1843-1932, was probably the most respected gardener of her time and her influence on the art of gardening is evident throughout the world today. Now, if you happen to own one of David Austins ‘Munstead Wood’ deep crimson roses, you will delight in also being able to enjoy seeing the garden that made it so memorable and unique. -a unique new bread is born, and it all started out in the garden…. I have been to this show 22 times now…I can’t believe it either! and each and every time I am always left amazed at the designs of the gardens, all of them – from the Showcase Gardens to the Fresh and Artisan Gardens to the extraordinary displays in the Great Pavilion – stunning floral and horticultural exhibits. For those seeing this show for the very first time, a little planning goes a long way and I will share some of my show secrets to help you enjoy it to the fullest! You must make the time to visit the area that showcases all kinds of artwork and all things gardening to find those special gifts to take home to remind you of your visit…products for your home and garden and for you! We will leave early this morning by coach to arrive at the show just as the gates open at 8 a.m. You have the whole day to spend here if you like as your ticket is good until the show ends today at 8 p.m. You will make your own way back to our hotel as you choose so don’t feel rushed. If you leave early and want some ideas of what to do on the way back, I shall share those with you. -all the Show Gardens have been built from scratch in just 19 days and will be dismantled in only 5 days and the Great Pavilion has enough room to park 500 London buses! NOTE: tonight is the only night we recommend you book tickets for a show or theatre as we leave tomorrow for the balance of our tour continues outside London. I love this garden…high on a hill with such panoramic views of the Essex countryside that take your breath away and put a bounce in your step as you wander through this ever evolving garden as the gardening team strive to retain the original intimacy and charm of this horticultural gem, while at the same time aiming to restore much of the estate to its former rural glory, including its historic hedgerows and woodland. The Dry Garden is one of the crowning achievements of Hyde Hall, created in 2001, it aims to show visitors how they can work with the environment and use drought-tolerant plants. The Hilltop Garden has a number of different areas to explore, including ponds, borders, rose borders and island beds and don’t forget to take in that view…. https://www.rhs.org.uk/gardens/hyde-hall/garden-highlights shop & café. Probably her most inspiring garden for us all with water issues is the Dry Garden. It was a parking lot – and now it is an education in itself, showing us all just how hardy some plants are and how they can tolerate little or no water. In fact Beth has a book called ‘Beth Chatto’s Gravel Garden’ that I am sure is in many gardeners library. ‘Repetition is key, says Chatto, to avoid a “moth-eaten carpet” effect’. I have had the pleasure of meeting her a few times now and delight in another visit here. A very special lady and her garden will delight you as well, it is a very special place. http://www.bethchatto.co.uk/ garden nursery and tearoom. The Dunston Hall Hotel for part of a collection of 27 four and five star luxury hotels across the U.K. The former De Veere Elizabethan style mansion was built in 1859 and lovingly restored to all its former glory and sent against 150 acres of stunning wooded Norfolk parkland, a setting just as unique as its history. Indoor pool and free wifi. Geoff was a firm believer and pioneer in organic gardening and Barnsdale was his ‘great experiment’ in peat free and chemical free growing. These techniques have been continued and the gardens at Barnsdale remain an outstanding example of these organic principles. Forgardeners, Barnsdale is an inspiring place to visit at any time of the year. With Britain’s largest collection of individually designed gardens, it’s teeming with great ideas. Here you will enjoy walking around the 38 gardens that have been created. http://www.barnsdalegardens.co.uk/tour_gardens.html http://www.barnsdalegardens.co.uk/index.html Tea Room & Shop. 1 night Accommodation at 4 Star, Cambridge Belfry Hotel, Cambridge Opened in June 2004, The Cambridge Belfry is an elegant modern hotel with excellent facilities including an indoor pool and free wifi. Since its opening in 1846, Cambridge University Botanic Garden has been an inspiration for gardeners. We owe the existence of today’s much larger Botanic Garden, occupying a 40 acre site to John Stevens Henslow, the Professor of Botany at Cambridge from 1825 – 1861. Henslow laid out the Garden to accommodate a wonderful tree collection. But he also planted his ideas about variation and the nature of species that would be taken up in a revolutionary fashion by his famous protege, Charles Darwin. The Glasshouse Range flanks the north side of the Main Lawn, and is full of year-round interest – from the daintiest alpine to exotic tropical climbers. The Botanic Garden holds the research and teaching collection of living plants for the University of Cambridge, which numbers over 8000 plant species. These include National Plant Collections, several important research collections, and Cantab plants. The Garden is also the major arboretum for the region. http://www.botanic.cam.ac.uk/Botanic/Home.aspx Garden Café and shop. We will enjoy Dinner tonight in the hotel. Borde Hill – ‘One of the Country’s Truly Great Gardens’ Including Guided Garden Tour. Royal Pavilion in Brighton – ‘A Pleasure Palace for a King’ Self Guided with Audio Guide Through Pavilion and Gardens. The Royal Pavilion is an exotic palace in the center of Brighton with a colourful history. Built as a seaside pleasure palace for King George IV, this historic house mixes Regency grandeur with the visual style of India and China. For 200 years, John Nash’s extraordinary oriental fantasy, the Royal Pavilion, has been inextricably linked with the identity of Brighton. It has provoked controversy, inspired fervent adulation and, throughout its colourful history, become one of the most instantly identifiable architectural images in the world. 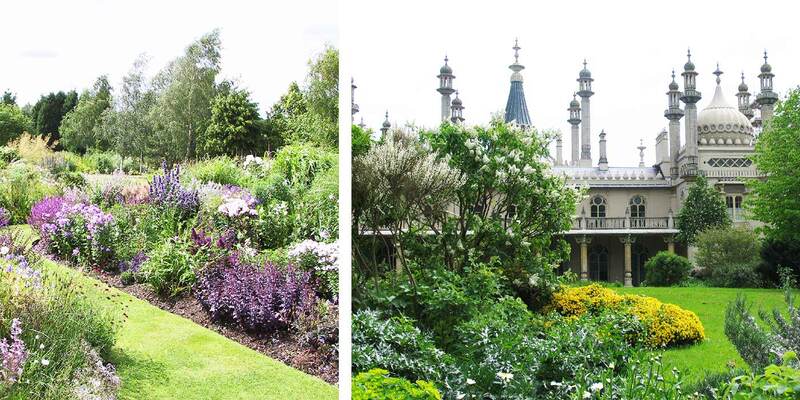 The Royal Pavilion gardens were designed by John Nash as a picturesque pleasure ground for the king. The garden designs reflect the revolution in landscape gardening that had begun in the 1730s. Straight lines and symmetrical shapes were replaced with curving paths, natural groups of trees and shrubs and picturesque views. During the late 19th century and first half of the 20th century the Regency gardens were altered almost beyond recognition. It was not until the early 1990s that the reinstatement of Nash’s garden scheme began, in parallel with a major structural restoration of the palace itself. The restoration took around 20 years to complete. 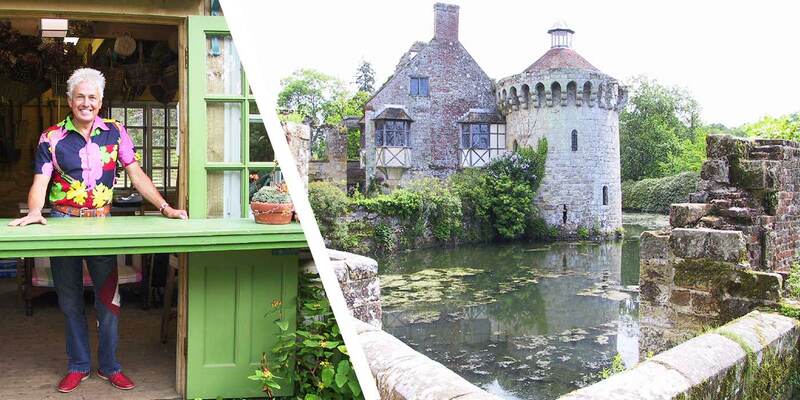 There is much to read up on this fascinating pleasure palace..
Country house, romantic garden, 14th century fairytale moated castle – all in a beautiful wooded estate! What more do you need! Well, not much, as this is indeed something worth seeing and being in the moment. The house was built by Edward Hussey III from the sandstone quarried from the grounds of the Old Castle. It is positioned to overlook the Castle and estate and the garden was also designed and created at the same time. This meant that all three elements: house, garden and estate would work as one in creating a perfect picturesque country home. From the early 18th century, British landscape gardeners had been creating gardens inspired by pictures, but by 1800 a backlash had set in. Critics considered the grassy vistas designed by Capability Brown too smooth and tidy. 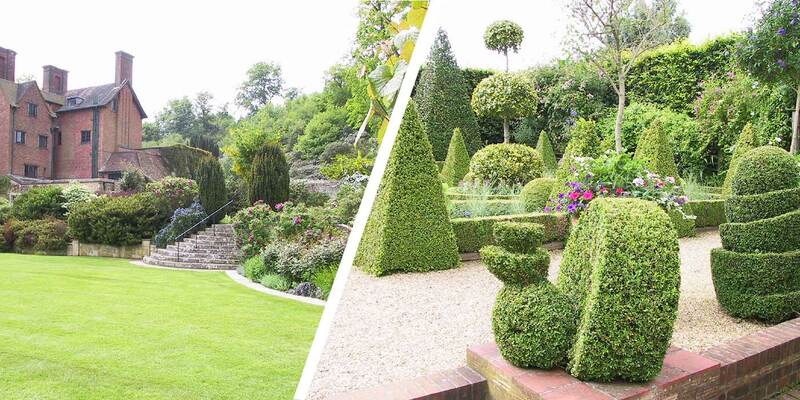 Scotney’s picturesque garden is a last fling in this backlash style of gardening. The garden has naturalistic planting which is seemingly untouched by human hand and its cloud-like planting of rhododendrons and azaleas creates a fairytale feel, with the ruins of the Old Castle at its center. Wisteria and old English roses adorn its sandstone walls, while the surrounding herbaceous beds are always throwing out new colours throughout the seasons. Where would we be if not for the romance of Vita Sackville-West and her husband Harold Nicolson. Historic, poetic, iconic; a refuge dedicated to beauty. Vita Sackville-West and Harold Nicolson fell in love with Sissinghurst Castle and created a world renowned garden for us to enjoy…and enjoy you will! Vita Sackville-West, the poet and writer, began transforming Sissinghurst Castle in the 1930s with her diplomat and author husband, Harold Nicolson. Harold’s architectural planning of the garden rooms, and the colourful, abundant planting in the gardens by Vita, reflect the romance and intimacy of her poems and writings. However, Sissinghurst actually began life as a Saxon pig farm and within a few years had become a small moated manor house, lived in by a family who shared their name with the place; the de Saxingherstes. Nothing remains today of the original house except for part of the moat. By the late 16th century the site had been transformed by the affluent Baker family who built a magnificent Renaissance courtyard house, complete with vaulted gallery, 37 fireplaces and tower at its center. Leased to the government during the Seven Years War (1756–1763), Sissinghurst was used as a prison camp for 3000 captured French sailors who largely destroyed the house. It is from this period that Sissinghurst became known as Chateau de Sissingherst or Sissinghurst Castle. In 1796 the Parish of Cranbrook took out a lease on Sissinghurst Castle Farm, creating a poor house where up to 100 men were offered housing, employment and food. By the 1800’s Sissinghurst was home to the Mann Cornwallis family who repaired the remaining buildings, leaving their legacy on the tower weather vanes marked ‘MC 1839’. Today Sissinghurst is also a working farm with cattle, sheep and pigs and home to rare species of wild flowers, insects and birds. Fantastic shop and delicious café. The National Trust acquired Chartwell in 1946/7 from a group of businessmen. They had purchased it from Winston for £50,000, who was finding the upkeep very expensive. It was then given to the National Trust on the proviso that Winston & Clementine could continue to live there for as long as they wished. Sir Winston left Chartwell in October 1964 in very poor health moving to his London flat in Hyde Park Gate. He celebrated his 90th birthday on 30 November and died on 24 January 1965. Lady Churchill decided that she would live in London and left Chartwell in June that year. Chartwell opened to the public in the summer of 1966. Lady Churchill, Lady Soames (the Churchill’s youngest daughter) and Grace Hamblin (former secretary to Winston) were mainly responsible for the way we see the house today. It is a beautiful home, situated on a hill with a view that looks out onto the hills beyond…I loved walking through the home, that was what it was and still is today, a home. It was decided to show the house as it was in the 1930s, the era when Winston, Clementine and their four children were all in residence. My favourite room is the Dining room. When Chartwell was left to the National Trust in 1966, the family of Sir Winston Churchill requested that there always be a marmalade cat named Jock, with a white bib and four white socks, in comfortable residence at Chartwell. Look out for Jock VI wandering around, a lucky rescue! West Green House Gardens – Simply Magical! and the Perfect Ending to our Tour! Nestling in a woodland corner of Hampshire is this ravishingly attractive 1720′s manor house, where busts of gods, emperors and dukes now framed with roses, watch over the gardens. West Green House Gardens demonstrate how creative energy is poured into garden making. It is a garden with a special and distinctive sense of place, made by acclaimed garden designer and writer Marylyn Abbott, selected as one of the top 20 living garden makers by Stephen Lacey for the Telegraph. He writes “her swash buckling annual potage displays, fountain gardens and torch lit operas reflect her energy and zest. Through her books she has pumped fresh air and sparkle into the world of period gardening”. The garden combines neo-classical style with contemporary design. A grand water staircase provides a focal point to the Nymphaeum Fountain designed by architect Quinlan Terry. The magnificent Walled Garden, faithfully restored to its original lines, is entered through an arbor of wisteria. An allee of apple trees divides its elaborate potager with its berry filled fruit cages, annual flowers and colourful vegetables from its signature perennial borders exuberantly planted in subtle hues of mauve, plum and blue. This special visit also includes an introductory talk and Traditional Afternoon Tea served in the flower filled greenhouse where we will also be celebrating the end of our time In England together. Their tea is one of the best, the presentation is perfection and I know each of you will take home a lasting memory from our visit here. Marylyn has one of the nicest shops as well so make time to visit it before we leave for that special memento. From West Green House Gardens we head to London Heathrow Airport and the 4 Star DoubleTree by Hilton, for overnight including breakfast the next morning which is your departure day June 2nd, 2017. NOTE that this tour is priced in British Pounds. Note – Minimum of 15 tour registrants required for this tour to run, so do not book your air until you have heard from us that the tour is confirmed.